Length of the game; normal, fast, or long. Playing with Zilch rules (zilch) or not (standard). Playing to a high score (goal) or playing a fixed number of turns (round). Can take over rolls (amish) or not (regular). Playing with Crazy dice (crazy) or not (sane). Playing with Wild dice (wild) or not (tame). Play 100 games of Greedy Greedy. Play 500 games of Greedy Greedy. Play 1000 games of Greedy Greedy. Roll 6 of a kind with each number. Win 20 games against one or more opponents. Win 100 games against one or more opponents. Win 300 games against one or more opponents. Roll 5 of a kind with each number. Don't bust on an Amish takeover with only 1 die left. Bust when rolling 6 dice. Don't bust when rolling the last die when you have 2 Zilch strikes. Roll a straight immediately followed by another straight. Win a game with exactly 10000 points. You don't even have a common ancestor. Win with no more than a 500 point margin. Win by a margin of 2500 points. Win by a margin of 5000 points. Win by a margin of 7500 points. Win by a margin of 10000 points. End a turn with at least 1000 points. End a turn with at least 2000 points. End a turn with at least 4000 points. End a turn with at least 8000 points. End a turn with at least 16000 points. I'm pretty sure you're the only one who enjoyed that. The journey of 1000 miles takes a long time when you're really slow. Fail to breach the initial barrier before the game has ended. Lose at least 1000 points on a single turn by busting. Lose at least 2000 points on a single turn by busting. Lose at least 4000 points on a single turn by busting. Lose at least 8000 points on a single turn by busting. You need a lot of ponies to make it express, preferably in tandem. Win with a score of 12500 or more in Classic or Zilch. Win with a score of 15000 or more in Classic or Zilch. Win with a score of 17500 or more in Classic or Zilch. Win with a score of 20000 or more in Classic or Zilch. Roll a 3-of-a-kind when rolling 3 dice. And they all know about it. Crazy, but just a little. Your therapist gets nervous when you arrive. You have begun to think about this as a lifestyle change. Your friends and family are concerned about you, they only did it because they love you. Nobody is brave enough to open that door ever again. Win with a score of 25000 or more with Crazy Dice. Win with a score of 30000 or more with Crazy Dice. Win with a score of 35000 or more with Crazy Dice. 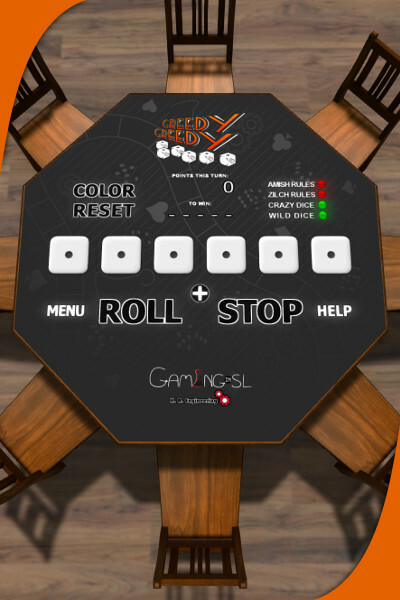 Win with a score of 40000 or more with Crazy Dice. End a turn in Amish mode with all six dice used. Use Wild Die to give yourself five-of-a-kind. Use Wild Die to give yourself six-of-a-kind.